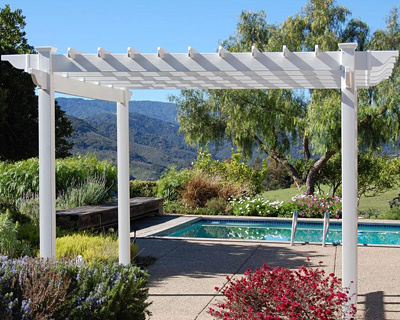 Add a regal feel to your backyard by accessorizing it with the Dura-Trel Queensbrook Pergola. This generous structure turns any section of lawn into an outdoor room, for you to relax in your backyard for many seasons. Four, white vinyl posts create a 90" square footprint, and perfectly support the top beams. Several slats rest perpendicularly atop these beams, offering both shade and style to the unit. The slightly curved end of each beam furthers the elegant look, while caps finish each upright. This vinyl pergola contains the greatest concentration of titanium dioxide available, to fully protect it from ultraviolet sun rays. Such high quality construction ensures the structure will never yellow, rot, peel, or warp, and can be cleaned in moments by rinsing with a garden hose. Use the included anchors to secure this item in your lawn, and allow the bold white color to create a focal point. Turn your backyard into a space fit for royalty with this Queensbrook Pergola. Assembly required. Made in the USA. Twenty year limited warranty.